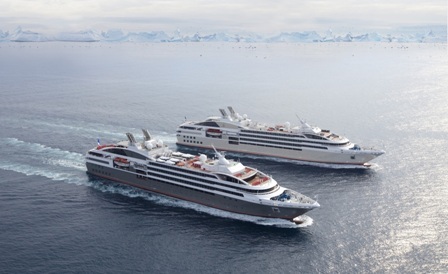 The fastest-growing source markets for Ponant are Australia, France and the United States, according to Herve Bellaiche, executive vice president of sales. The company has recently seen a significant expansion in the U.S. market with the purchase of assets from Travel Dynamics. The office has grown from a few workers in Miami to a staff of 30 and a Manhattan address. An Australia office overseeing Asia-Pacific that opened in late 2013 is also starting to pay dividends, while France remains the company’s number one market with loads of market penetration potential, said Bellaiche. The arrival of a fourth new ship this past spring in the Lyrial marks more luxury expedition tonnage, as Bellaiche works to grow his brand globally. The French brand may also be the best financed of the smaller luxury lines with the ideally sized five-star expedition ships occupying a niche with little competition. Now included in the ticket price are all beverages, moving the product to a more all-inclusive experience. “We are going to do more and more expedition cruises, that is clearly the plan,” noted Bellaiche. And they will, with double Northwest Passage sailings scheduled for 2015 before three of the four new vessels will head for Antarctica for the entire winter season. Next year will see the company’s first call in New York as well and provide an opportunity to show off tonnage in the U.S. market after a brief visit in 2014. “Our deployment has been more of an evolution,” said Bellaiche. "We consider ourselves different from (the other luxury lines), we do things they don’t. I don’t see a clear competitor,” Bellaiche continued. Driving strong sales has been the decision to extend the booking window. “Right now (in early June), every cruise is bookable through April 2017,” Bellaiche noted.